I’m honored to have Linda Gray Sexton join us today. Linda is the daughter of the Pulitzer-Prize winning poet, Anne Sexton. She’s an accomplished wordsmith in her own right, penning four novels—Rituals, Mirror Images, Points of Light and Private Acts—and three memoirs. Her first, Searching for Mercy Street: My Journey Back to My Mother, Anne Sexton, was named a New York Times Notable Book of the Year and was optioned by Miramax Films. Half in Love: Surviving the Legacy of Suicide, takes a hard look at her struggle with her own mental illness and the legacy left to her by her mother and her mother’s family. Join me now as Linda delves into her life and her work. From novels to memoirs, your books cover a startling range. How has your writing evolved over the years? After her suicide, I tackled a book her publisher suggested: a volume of her letters with narrative interspliced, so that it would become something of a biography at a time when no biography had yet been written. It was emotionally difficult to explore and write about my mother’s life in detail immediately following her death, but as her literary executor I was determined to make sure it was available for her many curious readers, who wrote to me often inquiring about the depths and facts of her life. Anne Sexton: A Self-Portrait in Letters gave them the taste they craved as they waited for a complete accounting of her life, which did not happen for many years. My mother was right, of course, about following me around like an old gray ghost. When I first began writing and then submitting my poems, while simultaneously writing Self-Portrait, they were rejected; I was compared, as she anticipated I would be, to her genius as a wordsmith. I knew I should switch, and so, when I was twenty-one, I wrote a non-fiction book about my personal life—that which my mother and I had often focused in our work together. Between Two Worlds: Young Women In Crisis examined the difficulties young women of my generation were experiencing in the early ’80’s, difficulties in balancing career, marriage and family—despite what feminism had taught us and in which we had believed so fervently. After that, I moved over to fiction, which, besides poetry, was my favorite genre to read. How many hours I spent hunched over Flaubert, Updike, Oates, and so many other accomplished novelists. I developed a passion for the form and just didn’t move away from it for many years, publishing Rituals, Mirror Images, Points of Light, and Private Acts over the course of the next decade. But then something devastating occurred: the rejection of my two next novels. I did not think I would recover as a writer and found it difficult to move onward with any book at all. But, at last, an idea burst from the deep well that all writers tap for their creativity: I began work on a memoir. Searching for Mercy Street: My Journey Back To My Mother, Anne Sexton was my passion, though I had never before dreamed of writing a memoir. The book was about forgiveness, written quite candidly about my life with my mother. To my surprise, it garnered wonderful reviews and that encouraged me to go onward to another memoir, Half In Love: Surviving The Legacy Of Suicide. Enduring a deep and dark depression, resulting from a bipolar break and a painful divorce, the book took some ten years to write, but with determination and hard work, it was eventually published in 2011. Then my life took an upswing. 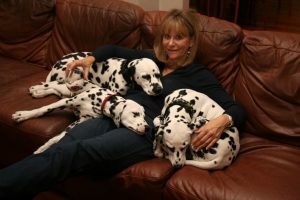 I discovered I was able to write about the positive aspects of my childhood—specifically, the joy Dalmatians had brought our entire family, (from the past of childhood through to my adulthood), as true therapy dogs for those of us who needed unconditional love and encouragement. This memoir, Bespotted: My Family’s Love Affair With Thirty-Eight Dalmatians, was published in 2014. Currently, I am working on another novel, one which is very different from those earlier books, which were about family mysteries and secrets. This one is psychological suspense, a genre I’ve always wanted to investigate, as I also love to read books like this. I am still in the middle of rewriting, but I hope to have my agent take it out to publishers fairly soon. Having begun writing in 1965, at eleven years old, and still pursuing my craft now, at sixth-three, I do indeed love the art of writing—whatever genre it may take. Poetry, fiction and creative non-fiction all bring me joy and fascination. Writers must be readers, and I have been both for all my life. You describe the legacy of suicide in your book, Half in Love. How much did the writing of the book provide catharsis versus raising demons? For me, a book about my family or me does not provide catharsis because the catharsis must already be complete before I begin to write. Otherwise the memoir that results is too much like a diary or journal, whose sole purpose is to vent and, perhaps, only to begin to understand what has happened, or is still happening, to the writer. For me, I must fully understand events and emotions before I begin to write. Otherwise I cannot put them down on the page with candor, self-reflection and the acquired wisdom that may eventually comfort others and bring them to new revelations about themselves. Half in Love helped those who were suffering from depression and thoughts of suicide, as well as family members trying to deal with their disease, because it accurately described the process in a reflective manner, and then offered the hope that I eventually found. When I was in the middle of writing it, if all I had been able to achieve was catharsis, I don’t think I could have offered the help that came with distance from the subject. What advice would you give to people living under the shadow of suicide? The best advice I can give is that offered in two of my blogs, published as “newsletters,” which go into intricate detail about the “shadow” of suicide and depression—from both the family’s and the affected person’s point of view. I have been in both places and have a lot to say about them. When National Suicide Prevention Month rolled around this year, I wrote two pieces about the subjects, and received a lot of e-mail from people who found them helpful and inspiring. You can read them on my website, at these two links: First: “Waking Up To Suicide.” And then “Steps To Fighting the Darkness. Read them in the order I’ve listed so that they make sense. In writing a memoir, I would struggle with the feeling I was violating the memory and privacy of loved ones. I wonder if you encountered that, and if so how you contended with it? This is always a problem a memoirist wrestles with: how much do you tell, how much do you withhold, how often do you ask those still alive if they approve of what you’ve written. I basically feel that my memories are my own. I don’t represent them to be factual or an exact truth. A memoir is not a biographer, written by an impartial observer. I like to use the metaphor that a remembered event is often totally recalled differently, even when two people have experienced the same thing. It is as if they have entered the same room, but through two different doors, and thus have a different perspective on what they see. And so, I only rarely ask those still living what they think of my interpretation of the past. For them, that past is always seen through the lens of their own memories, and so we can disagree and arguments can result. I do offer my galleys to family members who might be surprised about what I have written, as a way of making them feel included in the process, but I never promise to change anything as a result of their opinion. On the other hand, if something they want changed is minor and doesn’t affect my interpretation or recall of an event, I will respect their wishes. In terms of memories of those who are no longer with us—what memories are there to violate? The memories presented are totally your own and those family members aren’t around to read them. If I have presented such a person fully, with as much candor and honesty as I can muster—keeping away scrupulously from “venting” over past events—then I can feel good about what I am writing. It’s all a question of making sure you are as true to people and situations as you can be—but knowing from the outset that this will be your presentation of all that is past. Tell us about Searching for Mercy Street and what the title refers to. Searching for Mercy Street is about my journey back to my mother, and how I forgave her as a parent for her suicide, for her difficulties with her motherhood and for my troubled childhood. It is a memoir about forgiving whomever you have to forgive in your life. It was a hard book to write, but forgiveness was a more difficult emotion to come to in my life. It took me from the time of her suicide to the point shortly before I wrote the book to achieve it. “Mother, are you listening? Twenty years have passed since you confided that dream to me. I am still the gatekeeper, and I bring you good news. The spirit of the poems does go on past both of us—and many will be remembered in one hundred years. You wrote Between Two Worlds: Young Women in Crisis in 1979. How do you see the women coming of age today? Well, it is a very different generation than mine was. I often hear that young women today don’t identify with feminism at all, and that the young men with whom they may eventually have relationships or even marry, don’t approve of its agendas. In fact, for many in the US today, feminism is a dirty word. This makes me very sad. So much of what we fought for and achieved back in the 60’s and 70’s is now forgotten and taken for granted. There are so many freedoms we all enjoy that were won from a cause well-fought: paid maternity leave for both men and women; some day care centers at your place of employment; pay that quite often equals that of male counterparts, or which is close to that; a reduction in the glass ceiling; opportunities to rise without barriers in a chosen field; laws about sexual harassment. Often, young men view feminists as strident women who are trying to destroy the traditional family, even though there are many self-employed and happy stay-at-home Dads doing a great job. I don’t mean to criticize, but I wish there could be an acknowledgment and some gratitude for everything earlier feminism brought this generation of women. And there is still much work to be done. Who is going to do it? The new generation must. I know I’m going out on a big limb here! Self-Portrait is essentially a biography of my mother, told through her letters. I spent several years going through her archives, looking for the best correspondences and the best memorabilia, all of which would tell the story of her life in an informal manner. Interspersed between the letters is the narrative I wrote to make clear the relationships between the writers, the events that are occurring, or those that have occurred, in my mother’s life. It is a book for those who want to learn more about Anne Sexton, for those who love to read correspondences filled with humor, love and joy, and for those who want to read about the life—personal and poetic—of a creative woman. I think the most important advice I have to offer is that you must sit down everyday and write something—even if it is something poor that you will eventually pitch into your outbox. Being regular in your writing helps you to keep going, even when there is no “inspiration” to energize you. Writing begets inspiration, not the other way around. Just sit down and begin. You will discover it is not as hard as you think. And if you let days go by with nothing on the page, it will be like starting all over again every time—which is definitely a more difficult process. And even a paragraph counts toward this goal! One more thing: don’t throw anything away, even the most rotten writing. You never know when you will go back and discover a hidden nugget. Linda Gray Sexton was born in Newton, Massachusetts in 1953. She is the daughter of the Pulitzer-Prize winning poet, Anne Sexton. Linda graduated from Harvard in 1975 with a degree in literature. She has published four novels: Rituals; Mirror Images; Points of Light; and Private Acts. Her three memoirs include: Searching for Mercy Street: My Journey Back to My Mother, Anne Sexton; Half in Love: Surviving the Legacy of Suicide; and Bespotted: My Family’s Love Affair With Thirty-Eight Dalmatians. Linda is now at work on a fifth novel, and is now a regular contributor to The Huffington Post. You can find her latest article here. She lives in California with her husband and their three Dalmatians. This entry was written by A. R. Silverberry, posted on December 1, 2016 at 5:57 pm, filed under Author Interview and tagged Anne Sexton, Anne Sexton: A Self-Portrait in Letters, Fiction, Half in Love: Surviving the Legacy of Suicide, legacy of suicide, Linda Sexton Gray, Memoir, Mirror Images, novel, Points of Light, Private Acts, Rituals, Searching For Mercy Street, Searching for Mercy Street: My Journey Back to My Mother. Bookmark the permalink. Follow any comments here with the RSS feed for this post. Post a comment or leave a trackback: Trackback URL.